The pink light of dawn threw the higher ridges of Eigg and Morar into sharp relief. Under reduced rig in the steady southerly breeze Whisper of Sunart powered westwards.Time and again her stem rose to mask the horizon before dipping till only the sea could be seen…… rising to climb the hidden mountains – the huge ocean underswell unchecked for 3000 miles to the west – then dipping again till we were alone ‘in’ the hollows of the open sea. Somewhere out ahead, perhaps under that now faint plume of high cloud far away, there would be land. Hours must pass before we would be sure that 286 degrees had been the most accurate course to reach harbour. 50 miles to the northwest, a small group of 5 foreign Drascombes were hiding. Deep within one of those secret inlets small boat skippers love to explore along the west highland coast, they would be at anchor… their crews fast asleep. It was now almost 4 am. Why Whisper was not already in the Outer Hebrides too is a long story. 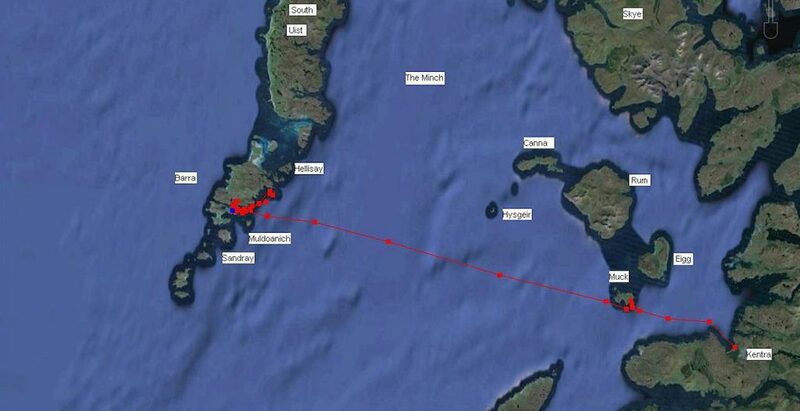 Suffice to say that a dose of flu had put paid to plans to join them before they launched and sailed west from Skye the week before. A last chance…. The magic of modern forecasting had revealed a period of evening calm which would end around 01.00 hrs. Wind would build through the morning to steady around 12 -16 knots from the south by 12.00. Later it would back more to the South East before increasing again as a front passed through. By 17.00 the islands would be buffeted by strong winds, bringing squalls and rain. The 48 hour forecast include a severe gale. To join the Dutch cruise that year one last chance remained: a voyage of almost 60 miles, far to the west of Whisper’s mainland home waters. The plot developed. By 3 pm enough water for Whisper to leave her tidal anchorage had flooded the bay. The ebbing water could carry us out and westwards along the north coast of Ardnamurchan -a simple 3-4 hour trip down tide towards the Isle of Muck. The light southerly scooped us up. We emerged into the outer loch skimming along downwind, settling to the rhythms of life at sea once more. In the flow of great tidal waters off the point, we gybed to the west. It was time to relax, make soup from the flask of hot water and catch the shipping forecast. Life was perfect. As the evening drew on bright pin pricks from lights on Eigg stood out ever more clearly against the shadows cast by the sinking sun. Gradually the fading light ‘took’ the breeze. Soon we were becalmed. This unusual trip had just one purpose: for once a critical schedule existed. 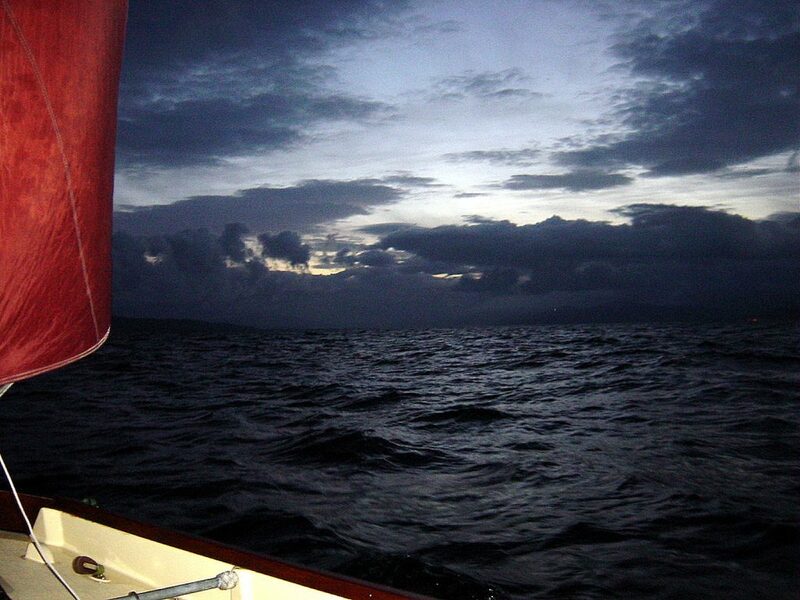 Unless we were rested and ready to leave Muck before dawn, the crossing further west next day was out of the question. So sails were furled. 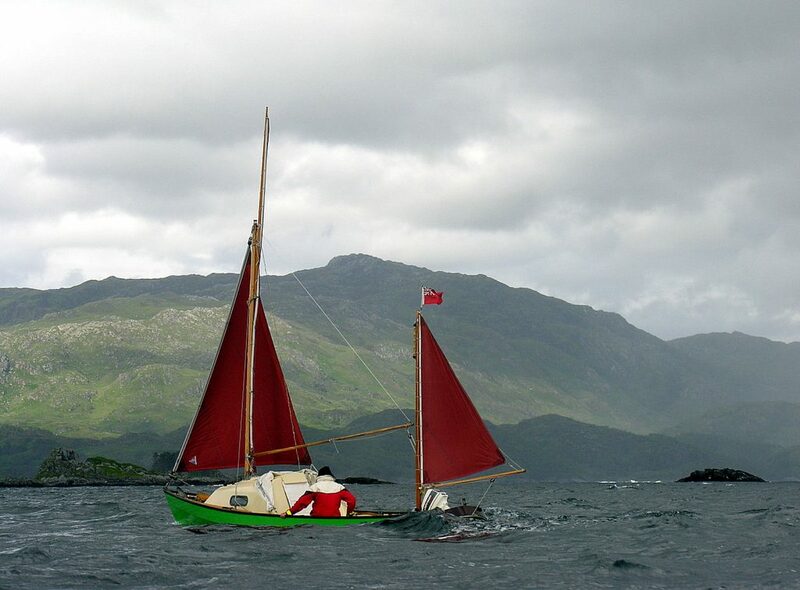 Soon the Johnston was shoving us hard towards supper and a kedge anchor in the shallows of Muck’s Port Mor. Not a soul was to be seen among the island houses as we surged in between the channel markers at dusk. We moved on in more gently to drop anchor inshore of two fishing boats, near the fine new island pier. Soon all three hot water flasks and the crew were replenished. Then the alarm was set. It was 10.45 pm. Time for a sleep. Rockall, Malin: S 2-4 backing SE. increasing 5 to 7 later, showers, fair, then good except in showers. I was fully awake now. If this trip was to happen further dozing was not an option. We simply had to get on with it. Leaving port in a hurry is never a good idea. For a single hander each part of the packing and stowing routine must be performed correctly, even in the dark. Bedding back in waterproof kitbags; cooker packed away. Water cans stowed securely. Hot water flasks and snack food boxes near at hand below the hatchway. Charts folded correctly; pilot book within reach. Main fuel tank topped up. GPS switched on and the waypoint list correctly programmed. Extra reserve dry clothing, towels, spare wooly hat and gloves, all wrapped in a proofed haversack: easy to reach. Then – that morning – five layers of clothing! Any fool can under-dress while out on the water – getting dressed up and staying dry on a small boat when alone is the harder part! It was late May, but so far this spring there had been little heat in the air. At that moment there was absolutely none! Even the previous day’s wind shift south had not fetched summer. As the King is known to have said to the white rabbit in ‘Alice in Wonderland’ …once we started there would be no stopping point: “Begin at the beginning, go on till you come to the end…and then stop”. It was almost 2 am. ‘Bruce’ came aboard while the motor purred softly in the half light calm. Carefully secured, the anchor and its heavy chain would remain out of reach on the foredeck till the passage was over. I checked the lashings a second time. Then as peacefully as possible, we motored gently out towards the flashing beacons that guard the narrow entrance to this little harbour. Dark grey shapes rose and fell to either side as the ocean swell reached between the beds of kelp that give slight warning at low tide of the perilous rocky outliers that lurk beneath. Just the slightest breeze began to ruffle the iron grey water. 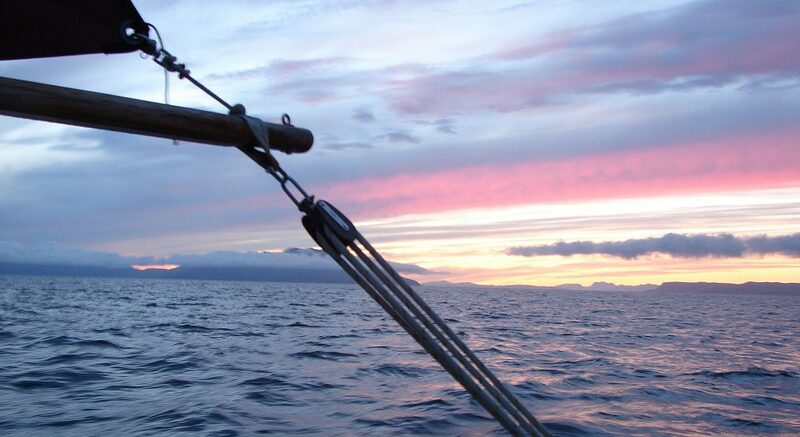 The jib was unfurled, the mizzen trimmed and we were off, motor sailing out to the south. We rounded the southern tip, into clear water. Whisper came alive as I unfurled the mainsail and threaded the tack and clew reefing lines so that I could swiftly reduce sail later. The plot had begun! 286…the tiny arrow within the eerie green eye of my trusty Garmin GPS swung till the numbers appeared. Where the arrow pointed was transferred to my grid compass. Next to the VMG speed figure, and the sobering ETA figure that fluctuated so very little, another small number shone out. It said 43 nm. A very long tack…..
Over the next 20 minutes as the dark outline of Muck receded, the wind filled in…a steady force 2-3. It was enough. The motor could rest. The shadow line of the last cliffs on Muck slipped past the starboard beam, there was just empty greyness ahead. Seven miles to the south Ardnamurchan’s great finger of light swung through the gloom. Occasionally as we topped a swell the loom from the light on Suil Ghorm off Coll lit the underside of clouds away to the south west. There was nothing else. The world was still asleep. By breakfast time we were having a thrilling sail. The wind was now around 12 knots just aft the beam; Whisper was moving well, rising and falling over a slight but building sea. Off to the north the thin pencil of the Hyskeir lighthouse could be seen through binoculars eight miles away. It appeared to “inch” back eastwards. Soon it would align with Garrisdale point – the western tip of Canna. The magic brain of the GPS conceded that fair progress was being made. A transit position line had already been marked on the chart. Watching the narrowing transit between Hysgeir and Canna I planned a ‘fix’, using a back bearing east to Beinn Hiant on Ardnamurchan. The silent green eye approved – no real match for the old timers’ eyeball Mk 1 method…..23 miles to go. And this was the pattern of the next hours. Whisper climbed and dipped, subduing the swells one by one. As we crossed a choppy shoal area into deep water Muck finally ‘sank’ beneath the wake astern. The deserted southern approaches to the Minch stretched all around. Not a ship or even a solitary sail to catch the eye. And yet, it was not at all clear which among the line of heavier cloud along the western horizon might hide the islands. Oh so slowly the little green window of ‘truth’ allowed the figures to change. A huge cruise ship moved hull down across the high face of Rum, now far behind. The distance to run became 20 then 18. Soon the ETA figure dropped below 5 hours for the first time. Surely a celebratory coffee was in order? By the time the next shipping forecast was broadcast, at 12.02, it was again time for a cuppa, but also for a second reef. There was no sense in pushing too hard. The wind had freshened, but as white tops appeared, the time to destination figure seemed to stall. The GPS course to waypoint now read 279. Obviously the flood tide had been carrying us north. I knew with two reefs in the mainsail we would be safe, even if what was now forecast arrived early. So I furled the jib, sheeted the mizzen hard amidships and let Whisper come up into the wind. The rudder… as usual restrained by a loop of cord… was midships. Despite the pitching, by standing within the security of the hatchway, both hands are free to tie in the second reef. Those advance preparations hours before –long before dawn – had made this fairly straightforward. Soon we were off again – jib set – hardly any less swift, but now safe. This is the Coaster’s most sturdy ‘bulletproof to force 6’ sail plan. A light shower swept down on us. The green eye suddenly confessed that just 12 miles remained. By now through binoculars I could identify the various lumps along the western horizon. The left one – which I had spotted by far the soonest and assumed to be Barra Island – proved itself to be Sandray. Then just to its right, another significant hump…showed itself as Muldoanich. 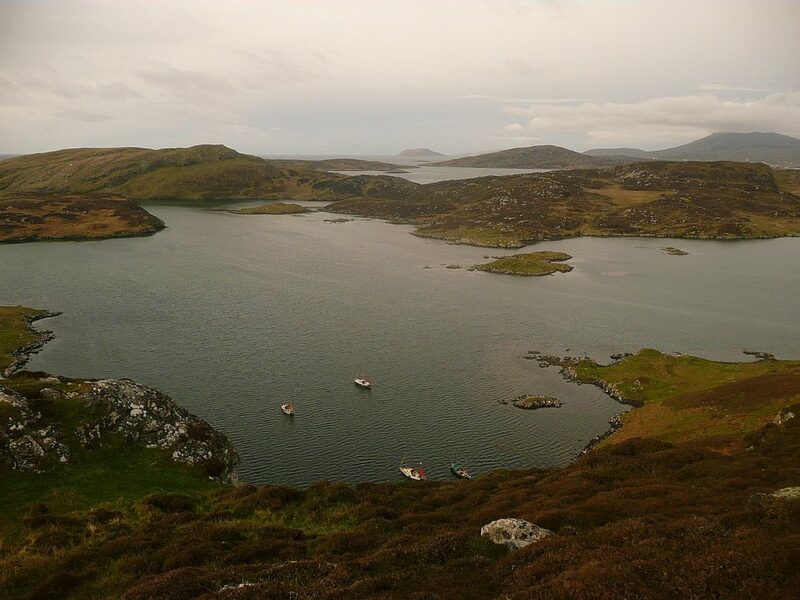 Rather to my surprise from seaward this small island rivaled the bulk of Barra Island itself. Far to the northwest the three distinct peaks: Hecla, Beinn Mhor and Truervein on Uist, – visible on a clear day from Ardnamurchan point – were now almost in line. Meanwhile far astern the tops of Rum and Eigg and my Ardnamurchan home appeared as a slight smokey smudge along the horizon. It was a grand sail. Speed climbed higher – for long periods it never dropped below 5 knots. Occasionally, if we timed a wave correctly, a slight surfing surge would ease the monotony. Of course this was no place for ‘play’. I furled several turns off the jib and firmly resisted any temptation to hurry. But the interval before wilder weather must arrive was ending. By three pm we had been at sea for over 13 hours. My head was full of maths: 13 x 4 knts. = 52 miles – we deserved to be there by now. The moment of departure – so many hours before – now seemed like a previous life. 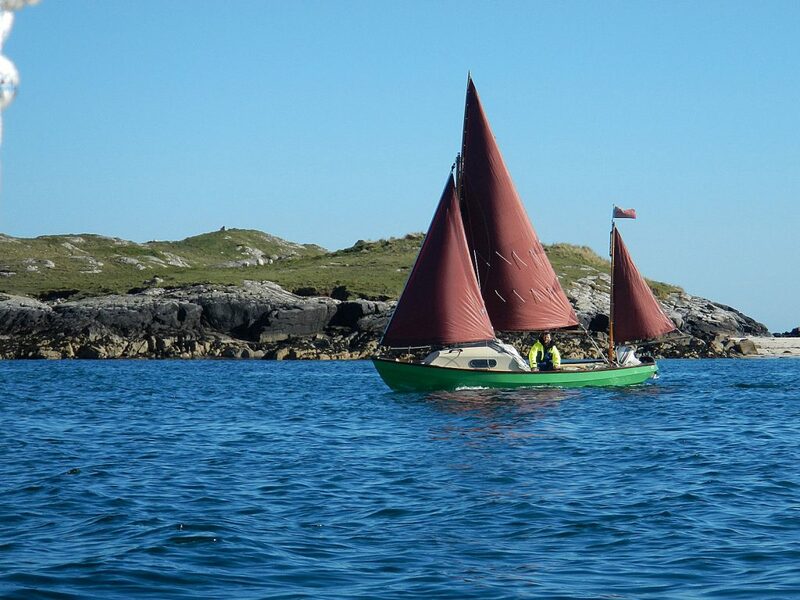 The full price for those peaceful first few hours out from Muck, when speed had hardly topped 3 knots, was being extorted. A dark blob appeared out in the distance. It was hard to say how far away. 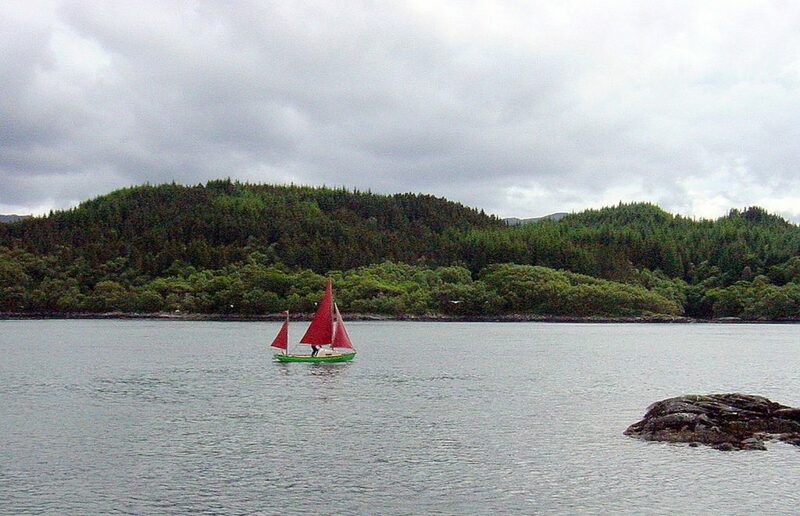 A Drascombe sits so low on the water distance off is always hard to assess. The Bo Vich Chuan marker buoy is very prominent. As we swept in towards it, the structure dwarfed Whisper! Locally the tide had peaked again. We would be pushing against the ebb as we headed into Vatersay sound. But there was no shortage of wind… right on cue it was backing steadily to the south east. A reek of heavy fuel oil reached me long before the Calmac ferry from Oban appeared, thundering out of the murk from far upwind. As ever, she powered past full of confidence, just as Whisper entered the narrower part of the channel. (frequent users of west highland waters will recall similar nervy incidents ?) The CCC Imray pilot book suggested less bravado was required. We complied! Then Whisper’s magic eye began to blink. 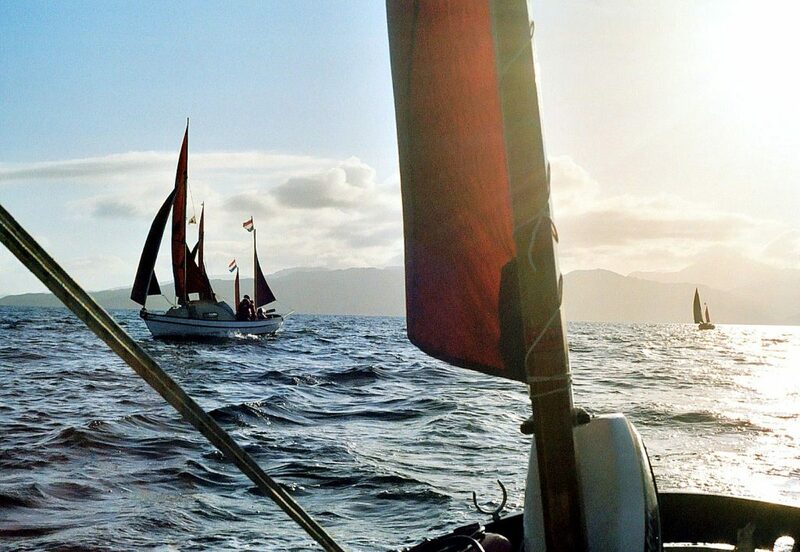 Passing between the Sgeir Dubh channel marker poles the course was run. Kisimul Castle on its little rocky islet stood ½ mile to the north, so we gybed across to inspect. But the gusty wind was getting stronger by the minute. That Castle Bay village anchorage seemed too public and exposed to the stronger winds that were set to batter us very shortly. 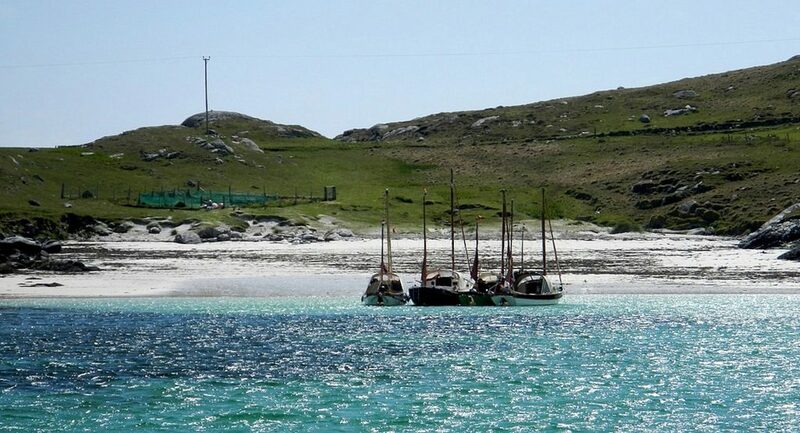 Indeed, as Whisper tacked back south under main and mizzen to anchor off a sheltered sandy beach on Vatersay, a heavier squall of rain came dashing through. In quick time the anchor was loosed and overboard, the sails furled, the spray hood raised. Hardly bothered about the all enveloping 5 layers… almost instantly I was fast asleep! Barely 2 hours later, the shipping bulletin roused me once again. The front had rattled through while I slept. The squally wind was easing. With supper warming on the stove…I sat musing. Was the desire for more sleep the best option? 60 miles lay astern – a fair course to run just to meet my friends. The latest forecast was horrible, there was no other word for it. The announcement had ended with those dreaded words: “southerly gale force 8, severe gale 9 later”. At that moment the most crucial word was ‘later’ – within 24 hours. If the Dutch skippers heard this, in their secret anchorage somewhere just a few miles away, they might move on. With no mobile signal, contact between us was impossible. Should they decide to head back north, or perhaps worm their way into Barra’s narrow north harbour seeking better shelter, I might never spot them…never cross wakes with them at all. Bright evening sunshine bathed the hillsides. It was a stunningly impressive location. With supper tidied away -inner man restored -the elements seemed at peace. I hoisted sail. Now rested, I determined to sail on to find the others. At 19.30 Whisper ghosted out, away from the bright white sands, back out to the chilly open sea. The heading was due north. Although never completely dark at this time of year, daylight would linger for another 3 hours at least. 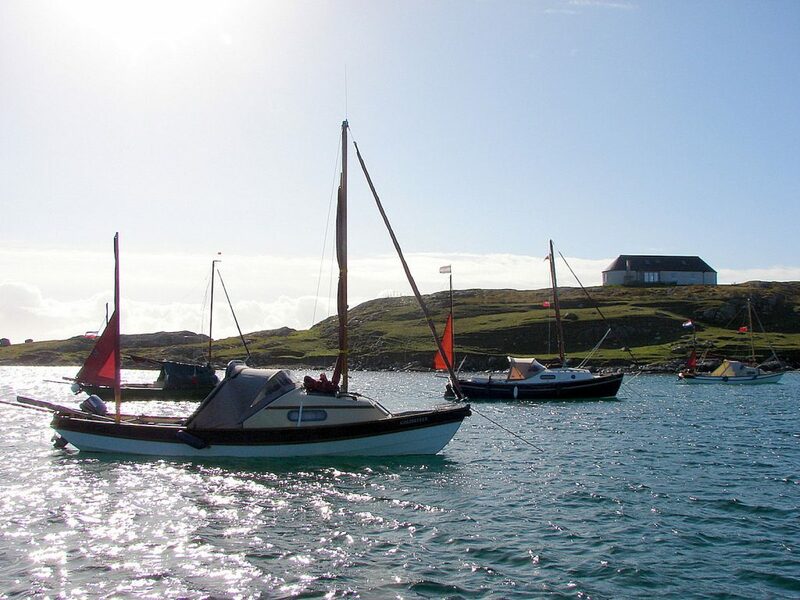 Hellisay, some 6 miles to the north, was where I knew the Dutch boats had relaxed, 36 hours earlier. That day’s headwind would have restricted their voyage plans. The pool between the islands remained the most likely place to find them. As it turned out I need not have shifted at all. An hour later a distant yacht appeared sailing south. 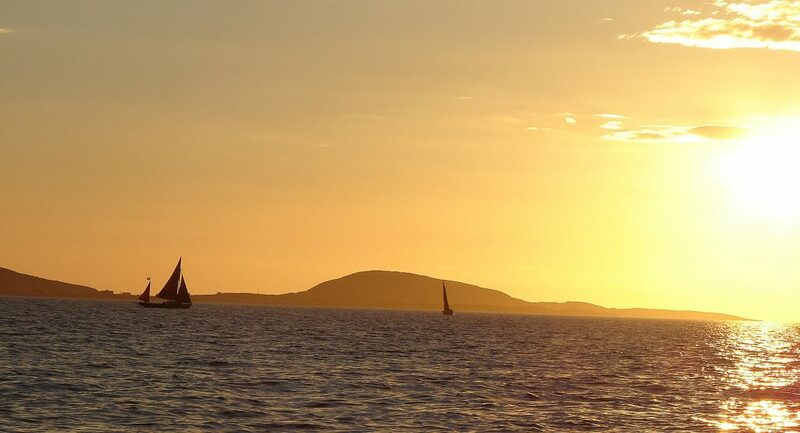 In silhouette against the late evening sun its size and distance were confusing…the sails huge and almost white in that slanting hazy light. But then, not far behind, another larger yacht appeared. .then another smaller one … suddenly there were 4 of them. They passed between me and Curachan – a huge Rocky islet shown on the chart – some four miles ahead. Tan sails all of them. ..I scanned and scanned again…. and there was the fifth…. right in among the shoals. It could only be the Dutch Drascombes exploiting the variable evening breeze to head south. Late that day, the old group of friends just as determined to sail onwards to find Whisper! Together we would head south to Vatersay to seek shelter off that lovely sandy beach from the coming storm.